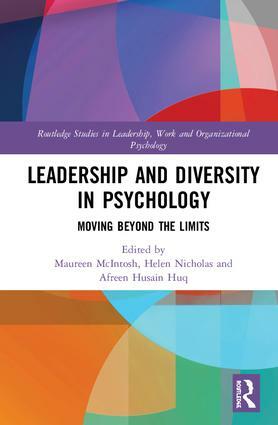 Leadership and Diversity in Psychology explores the topic of leadership and diversity from a range of different perspectives. The authors draw from professional experience and research to support their reflections on leadership with diverse populations, leadership in organizations and developing leadership style. Incorporating current theory and up-to-date research concerning current trends towards more relational and integrative work, the book emphasises practitioners’ reflections of their own experience. It reflects the contemporary focus towards more pluralistic/integrative practice, which has moved away from traditional orientations involving specific ways of working. Leadership and Diversity in Psychology will be of great interest to academics and researchers in the fields of clinical and counselling psychology and organizational psychology as well as professional practitioners. Chapter 7. Power and privilege in psychology: can we have egalitarian leadership? Chapter 10. ‘Managing self, managing others: What does owning one’s perspective add to leadership when you are a black woman in the NHS? Maureen McIntosh is a Chartered Senior Counselling Psychologist with the British Psychological Society (BPS) and registered with the Health and Care Professions Council (HCPC). She has worked in the NHS since 2002 with older adults and adults. She is an Associate Fellow of the BPS and she was the BPS Chair of the Division of Counselling Psychology [2016–2018]. Helen Nicholas is a counselling psychologist, registered with the Health and Care Professions Council (HCPC), a chartered psychologist with the British Psychological Society (BPS), a EMDR accredited practitioner and a registered coaching psychologist. She teaches on the BSc counselling psychology and clinical psychology and is the course lead for the MSc Counselling at the University of Worcester. Afreen Husain Huq is a Clinical Psychologist retired from the NHS, having worked in the NHS between 1985 and 2015 with older adults and been involved in diversity work in clinical practice as well as the BPS (formerly the Faculty for Race and Culture, and the FPOP).